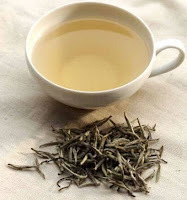 Drum Mountain White Cloud – Tenderly plucked, large silvery buds from the famous mountain where the monks of the Buddhist Drum Mountain monastery grew their tea for centuries. Drum Mountain is our House White, exemplifying the slightly sweet nature of White Tea, but adding a nuanced vegetal tone often associated with only the most refined Chinese Greens. Drum Mountain can be enjoyed morning, noon or night, but is always best relished on its own. This haiku is as close as we can come to describing the experience of Fuding White Treasure. This tea is unique among Chinese Whites. Hailing from Fujian province, renowned for many of its Green and Red Teas, Fuding is a recent favorite among White Teas in the tea world and as such, supply each year is limited. Bodhidharma’s Eyelids – A very special house blend of Organic Pai Mu Tan (White Peony White Tea) and Cha Hua (Tea Flowers). Our Cha Hua hail from Jing Mai Mountain in Southern Yunnan, where the tea trees range from 800 – 1,200 years old. Every fall the tea trees blossom just before producing seeds and going into winter hibernation. Cha Hua have a floral and fruity flavor, recalling apricot or honeydew on the nose, with a subtle sweet flavor hinting of fig. Delicious and soothing with only trace amounts of caffeine. The addition of Pai Mu Tan to these tea flowers adds body, balance and a nutty character. Enjoy this harmonious pairing in a gaiwan any time of day or night.